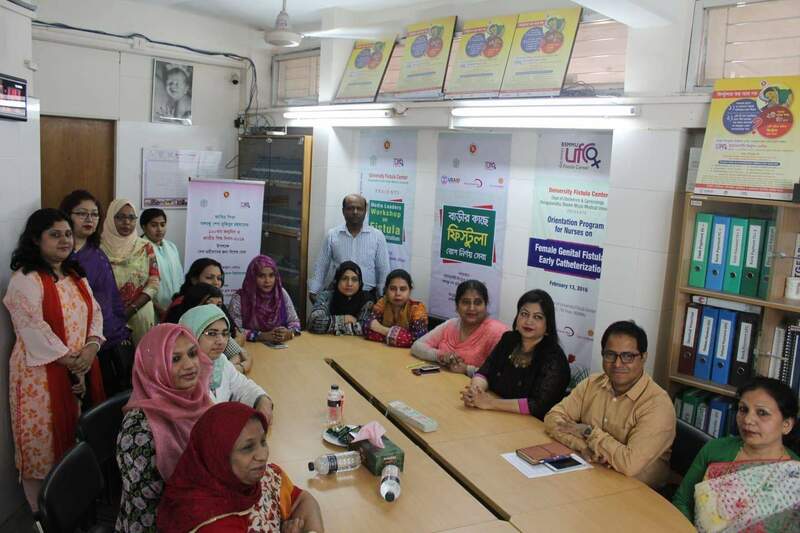 Bangabandhu Sheikh Mujib Medical University's Fistula Centre and Bangladesh Nari Sangbadik Samity (BANASAS) with the assistance of Fistula Care Plus of Engender Health Bangladesh arranged a special programme marking the 100th birth anniversary of Bangabandhu Sheikh Mujibur Rahman. The programme included a discussion meeting on Fistula diseases, exchanging greetings with fistula patients and serving special food to them at the Fistula ward of BSMMU today. Professor Dr Tripi Rani Das, chairman of Obstetrical and Gynaecological Department of BSMMU, presided over the programme. She demanded the nationalisation of the Fistula Centre and put emphasis on the rehabilitation and creating work opportunities of the incurable fistula patients. Among others, Obstetrical and Gynaecological Society of Bangladesh (OGSB) Secretary General Professor Dr. Saleha Begum Chowdhury, Fistula Surgeon Professor Dr Fahmida Zabin and Dr Sharmin Mahmud, Dr Sheuly Chowdhury, of Gynaecological and Obstetrical Department of BSMMU, Professor Dr Begum Nasrin, Engender Health Bangladesh Country Programme Manager and Global Event Manager Dr SK Nazmul Huda, Dr Ishrat Jahan, Dr Farhana Alam, Bangladesh Nari Sangbadik Samity (BANASAS) President Nasima Akter Shoma, General Secretary Anjuman Ara Shilpi, Joint Secretary Mahmuda Akter, Treasurer Ishrat Farhim, Executive Committee Members Fatima Munni and Salma Afroz also spoke. The speakers remembered the affection of Bangabandhu Sheikh Mujibur Rahman for the neglected group of the society. They urged all to come forward for the treatment and rehabilitation of the Obstetric Fistula Patients. University Fistula Centre, BSMMU has been working for the fistula patients for long with the assistance of Engender Health Bangladesh.